The Von Meijenfeldt family live in the Netherlands and Canada. There are more than 100 members, divided over three branches (De Haas, De Koe and Augustijn). In spite of the small size of the family, the name is rather renowned in the country. A clarification for this could be the apparent foreign nobility and a variety of articles about a few members of the family on the front pages of national newspapers. 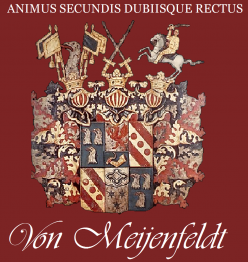 Less than 100 members of the family Von Meijenfeldt have lived and died in the Netherlands. The first ancestor, Johan August, arrived in Amsterdam 1 May 1793. He was born around 1760 in the vicinity of the old Hanseatic harbour city of Stralsund in Swedish-Pomerania on the Baltic Sea. There is a lot more than circumstantial evidence that Johan August was a natural son of the Swedish Count Johan August von Meijerfeldt (1725-1800), Field Marshal in the Swedish-Russian War 1788-1790. Names, places, dates and drawings in Sweden, Germany and the Netherlands show so many similarities that one can negate coincidence. Before his wedding to the Finnish Countess Lovisa Augusta von Sparre (1745-1817) in 1763 the Count took part in the Austrian Succession Wars. He first went into the Emperor’s military service in Silesia, the Netherlands and Hannover. Afterwards he was needed in Swedish service in Pomerania, where he spent the long cold winters on his Nehringen Estate. The noble Meijerfeldt family joined life at the Royal Court in Stockholm in full French style. Two sons were born and subsequently died from shot wounds (Johan August 1766-1791) and meningitis (Axel Fredrik 1769-1795). The father of the field marshal was (also called) Johan August von Meijerfeldt (1664-1749). He was governor-general of Swedish-Pomerania after he married Brita Barnekow in 1717. After the king donated the Nehringen Estate to him, he restaured the buildings, especially the St. Andreas Church. His son built the new manor house around 1880. The church was saved from demolition by the vicar during communist times. Finally the Lords ‘loge’ inside the church has been inaugurated. The governor-general acquired the Nehringen Estate and became count because of his brave and loyal adventures with King Charles XII in Livonia, Poland, Saxonia and Ukraine between 1700 and 1715. Earlier in 1694 he had been contracted by the Dutch Republic Province of Zeeland under the combined forces of William of Orange, the English King and Dutch Prince. Twenty years prior to this (1674) Anders Meijer – the father of Johan August von Meijerfeldt – was raised in Swedish nobility adding “feldt” to the name. The main motivation was that he was able to smuggle out a description of the Danish Glückstadt fortress in which he was captured, together with a plan on how to conquer it. Anders became Inspector-General over de Livonian domains of Oberpahlen. The first Meijer was Johan in 1480, serving the Livonian Order. In 1510 he was the warden of the fortress of Riga. His fief was Bubbusch (now Pabaze in Latvia). When the Order was liquidated in 1562, his grandson Hinrik and his descendants decided to serve the Swedish governor in Estonia. One source claims the Meijers come from Belgard in Pomeranian Brandenburg. Many people with a similarly sounding family name used to live in Europe but were not related. Several Swiss, Austrian and German noble families from Konstanz, Maienfeld and Rösebeck have died out. Many Jewish namesakes emigrated from Hessia to the United States between 1850 and 1920 after they adopted the name of their employer or created an own concoction of their first name Meijer, forced on them by Napoleontic rules.